Super easy. Start some (brown) rice, or pasta water. 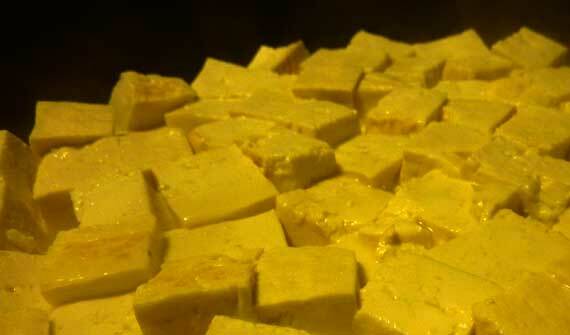 The fastest version: saute some slightly dewatered tofu. Add BBQ sauce. Serve on top of rice or pasta. Details… Dewater the tofu by putting the block(s) between two flat plates, with a weight (e.g., iron skillet, can of tomatoes) on top for a few minutes. Slice blocks in half, then cube. I prefer cubes about 5/8 to 1 inch on a side. Wipe off excess moisture and add to medium-hot skillet with some olive oil. Let sit for a few minutes (five? ), then flip to put a fresh side down. Do this several times if you want. Add BBQ sauce. I use some ketchup and some hickory-smoked sauce, with a few squirts of sriracha for heat. Stir gently. Sometimes I start by sauteing some onions. You can also add veggies. Spinach is good! Grated carrots also….